The door lock switch goes bad if pressing the button does not lock or unlock the door or the usual functionality fails to work. Power door locks (also known as electric door locks or central locking) allow the driver or front passenger to simultaneously lock or unlock all the doors of an automobile or truck by pressing a button or flipping a switch. Today, many cars with power door locks also have a radio frequency remote keyless system, which allows a person to press a button on a remote control key fob. Currently, many luxury makers also allow the windows to be opened or closed by pressing and holding a button on the remote control key fob or by inserting the ignition key and holding it in the lock or unlock position in the external driver’s door lock. 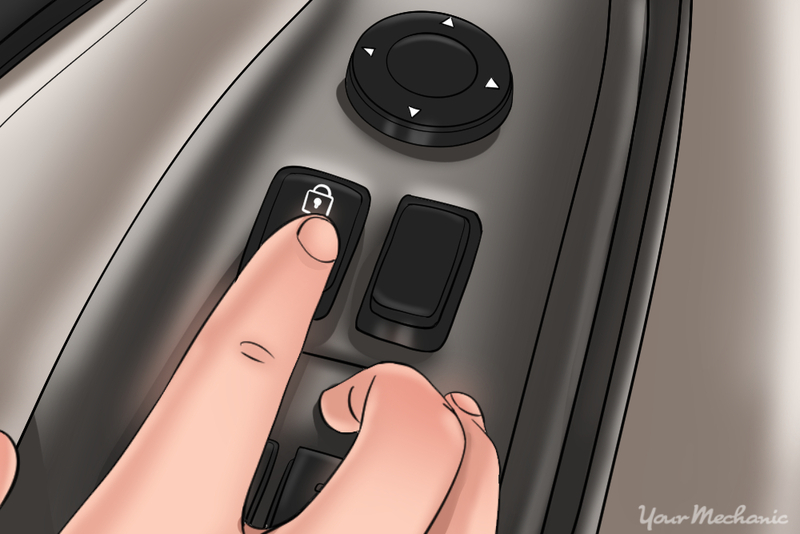 The remote locking system confirms successful locking and unlocking through either a light or a horn signal, and usually offers an option to switch easily between these two variants. Both provide almost the same functionality, though light signals are more discreet while horn signals might create a nuisance in residential neighborhoods and other busy parking areas (e.g. short-term parking lots). Some manufacturers offer the ability to adjust the horn signal volume. The remote locking device only can be used within a specific distance of the vehicle’s location. However, if the battery in the remote locking device drains out, the distance to the vehicle’s location becomes shorter. More and more drivers are relying on the remote locking device to lock their vehicles after they have walked away. The system may show signs that the locking device is working, but the doors may not be locking correctly. Step 1: Locate the door with the damaged or faulty door lock switch. Visually look at the door lock switch for any exterior damage. Gently press down on the door lock switch to see if the locks will activate the door locks. Note: Some vehicles will only operate the door locks with the key in the ignition and the tumbler turned to on or accessories position. Having all of the necessary tools and materials prior to starting the work will allow you to get the job done more efficiently. Step 1: Park your vehicle. Make sure it is parked on a hard flat surface. Step 2: Place wheel chocks around the rear tires ground. Engage the parking brake to the lock the rear tires from moving. Step 3: Install a nine volt battery saver into your cigarette lighter. This will keep your computer live and keep your setting current in the vehicle. If you do not have a nine volt battery saver, that is ok. 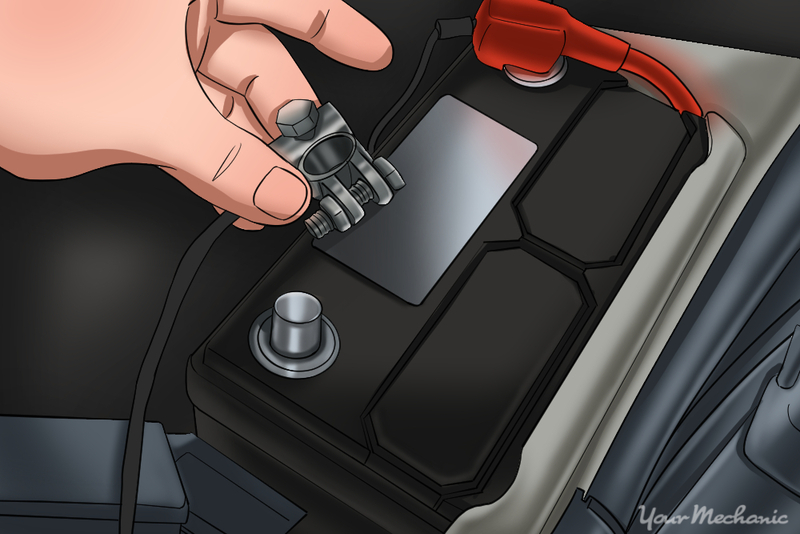 Step 4: Open the vehicle’s hood to disconnect your battery. Take the ground cable off of the battery’s negative post disabling the power to the door lock actuator. Step 5: Locate the door with the faulty door lock switch. Using a flat tip screwdriver, slightly pry up all around the door lock cluster panel. Pop out the cluster panel and remove the harness from the cluster. Step 6: Slightly pry on the locking tabs on the door lock switch. Do this with a small flathead screwdriver. Pull out the switch from the cluster. You may need to use needle nose plyers to help pull out the switch. Note: Keep in mind, some door and window clusters are not serviceable and require the cluster to be replaced as a whole unit. Note: Prior to hooking up the harness, be sure to clean it with electrical cleaner. Step 7: Locate the door with the faulty door lock switch. Step 8: Remove the outer door handle on the door panel. This is attached by one cross tip head screw in the outer edge of the door. The upper of the two screws are visible just above the latching mechanism and is partially hidden under the rubber door seal in the door. Remove the two screws that hold the door handle to the door shell. Push the handle forward to release it and pull it away from the door. Note: Be sure to examine the two plastic seals on the door handle and replace if necessary. Step 9: Remove the inner door handle. To do this, pry the cup shaped plastic cover out from under the door handle. This component is separate to the plastic rim around the handle. There is a gap in the forward edge of the cup shaped cover so you can insert a flat screwdriver. Remove the cover and underneath is a cross tip head screw which must be removed. The plastic rim can then be removed from around the handle. Step 10: Remove the window crank. Ensuring the window is closed, pry up the plastic cover on the handle (the handle is a metal or plastic arm with a metal or plastic clip). Remove the cross tip head screw holding the door handle to the shaft and then pull the handle off. A large plastic washer will come off with the handle. Take notes or a picture on which way it sits against the door. Step 11: Remove the panel on the inside of the door. Gently pry the panel away from the door all the way around. A flat screwdriver or a lisle door tool (preferred) helps here, but be gentle so you don’t damage the painted door around the panel. Once all the clips are loose, grab the panel top and bottom and bend it slightly away from the door. Lift the whole panel straight up to lift it clear of the catch behind the door handle. As you do this a large coil spring will fall out. This spring sits behind the window winder handle, and it’s somewhat fiddly to get back into place as you reinstall the panel. Note: Some vehicles may have bolts or torques bit screws that hold the panel secured to the door. Step 12: Slightly pry on the locking tabs on the door lock switch. Do this with a small pocket flathead screwdriver. Note: Prior to hooking up the harnesses, be sure to clean them with electrical cleaner. Step 13: Remove the panel on the inside of the door. Gently pry the panel away from the door all the way around. Remove the screws that mount the door grab handle in place. Remove the screws in the middle of the door panel. Use a flat screwdriver or a lisle door tool (preferred) to remove the clips around the door, but be gentle so you don’t damage the painted door around the panel. Once all the clips are loose, grab the panel top and bottom and bend it slightly away from the door. Lift the whole panel straight up to lift it clear of the catch behind the door handle. Note: Some vehicles may have torques bit screws that hold the panel secured to the door. Step 14: Disconnect the door latch cable. Remove the harness to the speaker in the door panel. Disconnect the harness at the bottom of the door panel. Step 15: Disconnect the lock switch harness from the cluster control panel. Using a small pocket flat tip screwdriver, slightly pry on the locking tabs on the door lock switch. Step 1: Pop the new door lock switch into the door lock cluster. Ensure that the locking tabs snap onto the door lock switch keeping it secured. Step 2: Hook up the harness to the door lock cluster. 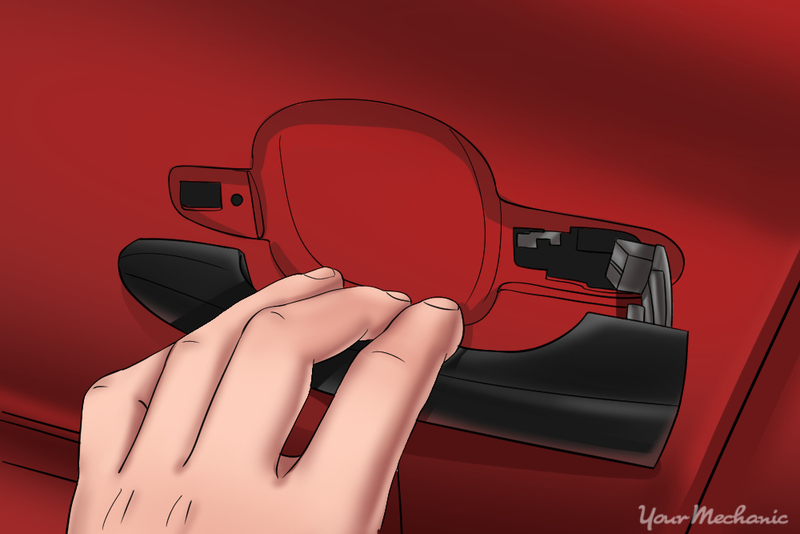 Snap the door lock cluster into the door panel. You may need to use a pocket flat tip screwdriver to help the locking tabs slide into the door panel. Step 3: Pop the new door lock switch into the door lock cluster. Ensure that the locking tabs snap onto the door lock switch keeping it secured. Step 4: Hook up the harness to the door lock cluster. Step 5: Install the door panel onto the door. Slide the door panel down and in towards the front of the car to ensure that the door handle is in place. Snap all of the door tabs into the door securing the door panel. Step 6: Install the window crank handle. 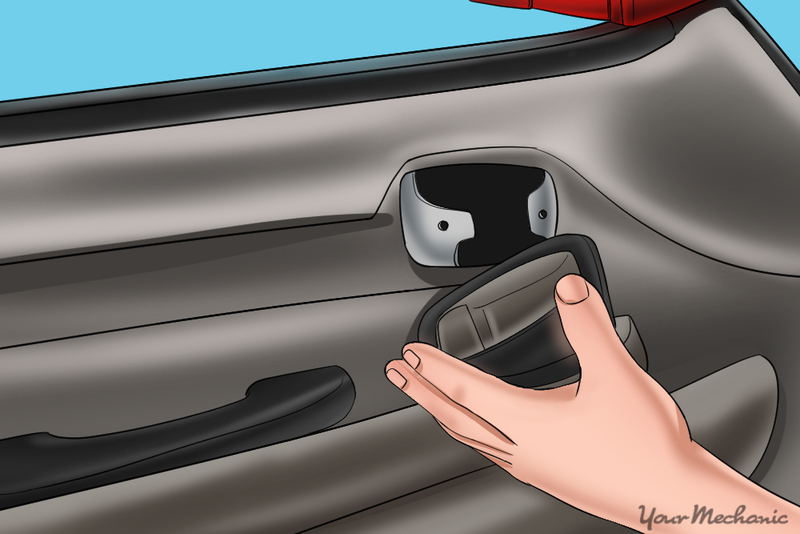 Make sure that the window crank handle spring is in place prior to securing the handle. Install the small screw to the window crank handle securing it. Install the metal or plastic clip onto the window crank. Step 7: Install the inner door handle. Install the screws to secure the door handle to the door panel. Snap the screw cover in place. Step 8: Pop the new door lock switch into the door lock cluster. Ensure that the locking tabs snap onto the door lock switch keeping it secured. Step 9: Connect the lock switch harness to the cluster control panel. 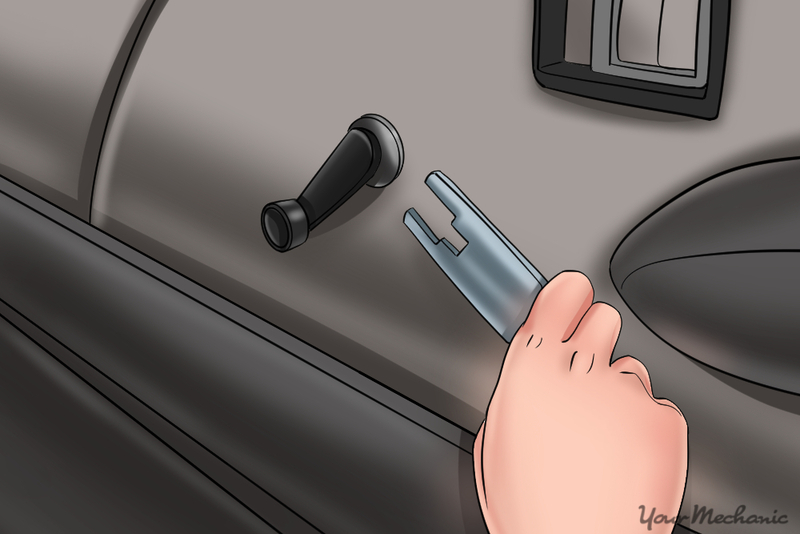 Step 10: Connect the door latch cable to the door panel. Install the harness to the speaker in the door panel. Connect the harness at the bottom of the door panel. Step 11: Install the door panel onto the door. Slide the door panel down and in towards the front of the car to ensure that the door handle is in place. Snap all of the door tabs into the door securing the door panel. Install the screws in the middle of the door panel. Install the door grab handle and mounting screws to the handle. Step 1: Open the vehicle’s hood. Reconnect the ground cable back onto the battery’s negative post. Remove the nine volt battery saver from the cigarette lighter. Step 2: Tighten the battery clamp. This will ensure that the connection is good. Note: If you did not have a nine volt battery saver, you will have to reset all of the settings in your vehicle, like your radio, electric seats, and electric mirrors. There are two functions on the door lock switch: lock and unlock. Press on the lock side of the switch. The door should lock with the door in the open position and in the closed position. 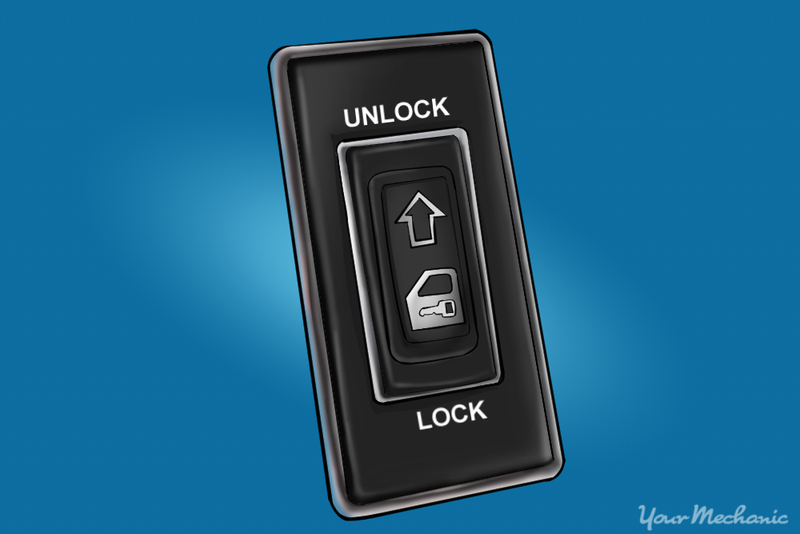 Press the door unlock side of the switch. The door should unlock with the door in the open position and in the closed position. Place the key in the ignition and turn the key on. Operate the door lock switch. With the door in the closed position, the door should lock. 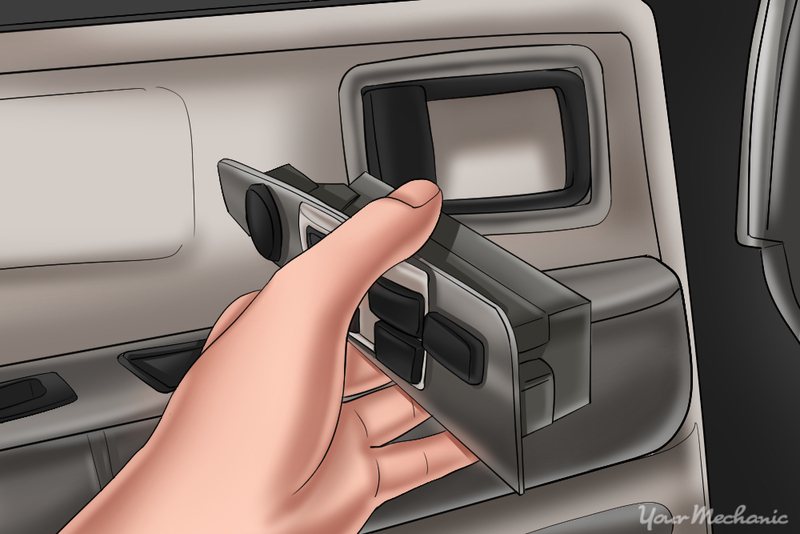 When operating the driver door lock switch with the door in the open position, the door should lock then unlock. While standing outside the vehicle, shut the door and lock it with the electronic device only. Operate the outside door handle and you will find that the door will be locked. Unlock the door with the electronic device and operate the outside door handle. The door should open. If your door will not open after replacing the door lock actuator or if you do not feel comfortable doing the repair yourself, then have one of YourMechanic’s certified technicians perform a door lock switch replacement to get your system working properly again. 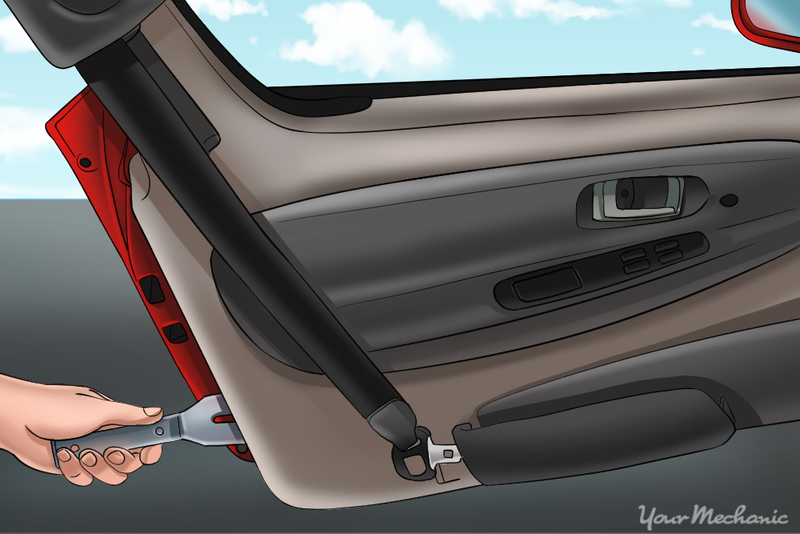 Q: Can slamming car doors lead to rattling noises in the door? Q: I have a 2004 Dodge Ram quad cab with a 5.7 liter 8 cylinder engine. When I put truck in 4 wheel drive and move I hear a clucking.